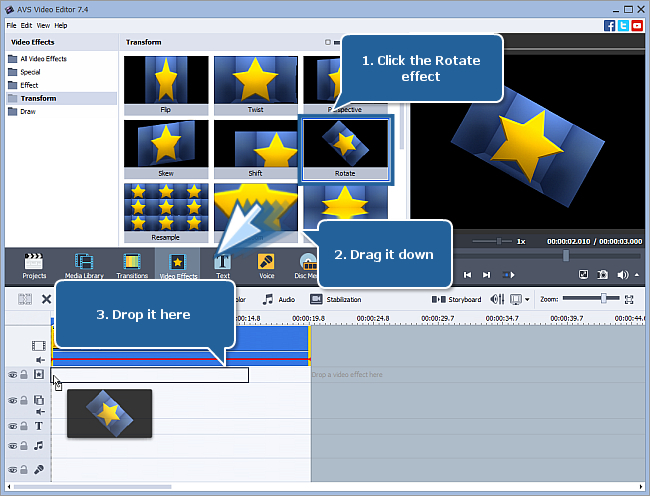 How to Rotate a Video with AVS4YOU? If you imported a video record from your smartphone or digital camera and discovered that it had been shot in an incorrect orientation, you can easily fix this issue with AVS Video Editor and then watch your video in a comfortable mode on any device. You can rotate the entire video or a certain scene only in a desired direction, changing its orientation from the landscape to the portrait one and vice versa. You can also get an original effect rotating the video clip by an arbitrary number of degrees and setting the fade in and fade out effect areas. After you import your video into the application and add it to the timeline, please follow the steps below to rotate your footage. To rotate your video just apply the Rotate effect. 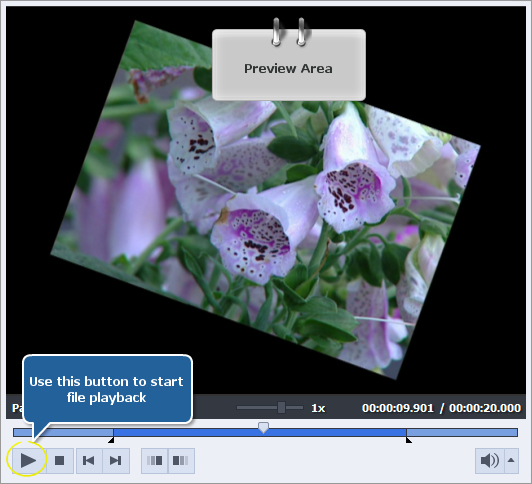 It allows you to change the entire video image orientation. 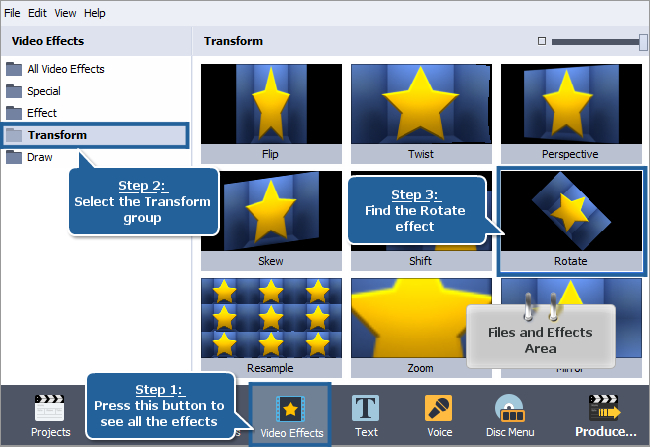 To add the Rotate effect to the timeline, right-click it and choose the only available option of the express menu - Add or Replace Video Effect. After doing this, the effect will be displayed on the timeline. 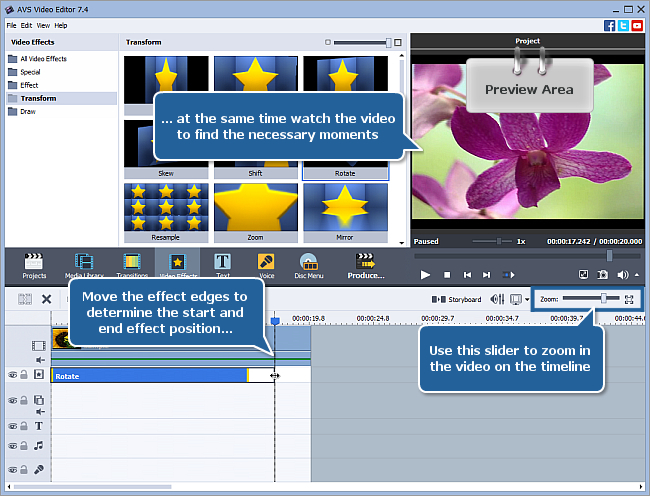 The Rotate effect is now placed at the current cursor position on the timeline and occupies the standard room within the video effects line. 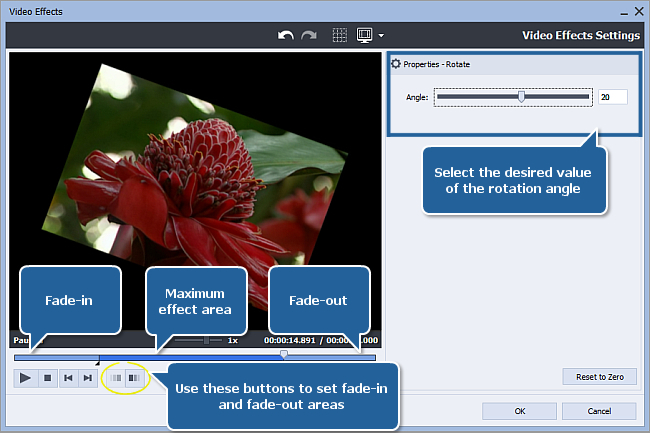 to rotate a video clip by any number of degrees, enter the value you need. You can try different values to choose the one that suites you best. The 0 value corresponds to the original video orientation. You can also click the Set to Zero button to discard the changes. You have done a good job! Now you can upload your resulting movie to YouTube, Facebook, or any other service and share your creative work with others.